The brilliant white colour of our cobalt rings is not just a plating or finish, it is the natural colour of the ring, all the way through. We have cut a cobalt wedding ring into several pieces just to show you the internal colour of our cobalt rings. You can see it is still a brilliant white colour inside. Cobalt rings are extremely tough in wear, and more scratch resistant than any of the precious metals, or titanium. Although scratch resistant, they are not scratch proof so it is likely that you may mark the ring in time, however, most independent jewellers are able to repolish cobalt rings, including ourselves. 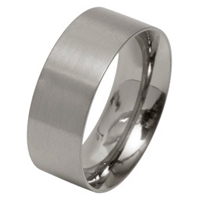 Due to the hardness of cobalt rings, they are the most difficult of the rings to remove in an emergency as the normal steel blades in ring removal tools are not able to cut through the ring. They can however be removed within minutes using a small diamond impregnated blade. We intend to add a video very soon on how to remove a cobalt ring yourself at home, using a small diamond cutter. The cobalt chrome ring will be packaged in a slim ring box when either 1st Class, or Free UK Delivery is chosen as your delivery option. The unbranded slim ring box allows us to send the cobalt ring for a cheaper rate with Royal Mail's new priced by proportion policy. This allows us to maintain a subsidised 1st class, and free delivery service. The cobalt chrome ring will arrive in a cobalt branded ring box when Special Delivery, or International Delivery is chosen as your delivery option. Please note that we are not able to package the cobalt ring in the branded ring box if you have opted for Free Delivery or 1st Class Delivery as the cobalt ring box is wider than the 25mm limit set by Royal Mail.